Ciudad Hidalgo (Mexico) (AFP) - Thousands of US-bound Honduran migrants remained stranded Saturday after spending the night on a border bridge between Guatemala and Mexico where riot police barred their progress. Honduran President Juan Orlando Hernandez said he would meet Saturday with his Guatemalan counterpart Jimmy Morales to discuss the next steps in the crisis, which has triggered escalating anti-immigrant rhetoric from US President Donald Trump. Hundreds slept in the open on the bridge over the Suchiate River and in the main square of the Guatemalan border town of Tecun Uman. Hernandez said on Twitter he had asked Guatemalan authorities "to contract land transportation for those who wish to return -- and airlift in the special cases of women, children, the elderly and the sick -- and we will continue with this operation as long as necessary." More than 300 people have taken up a government offer of a bus ride home to their country, police said. However, the vast majority have opted to wait on the bridge over the Suchiate River where Mexican authorities insisted they would have to file asylum claims one at a time in order to enter the country. On Friday, they began letting them through in a trickle -- first women and children, who were ushered onto trucks and taken to shelters. The caravan of mainly Honduran migrants had surged through a series of police lines and barricades up to the final fence on Mexico's southern border on Friday. Sections of the crowd hurled rocks and other objects at hundreds of riot police, who responded with rubber bullets and tear gas -- stalling the caravan which left Honduras last Saturday determined to reach the United States. Several people were injured. Police used tear gas to drive the migrants back and calm was restored. Mexican President Enrique Pena Nieto described the situation as "unprecedented." Organizers of the caravan said a section of the crowd had confronted the police and spoiled what had been an orderly attempt to cross into Mexico. 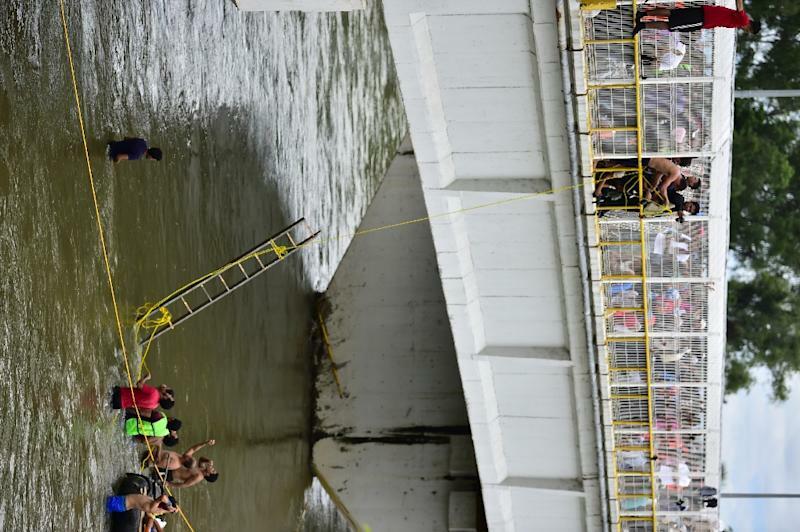 Some camped on the bridge "are very aggressive and no longer have patience, they are already desperate because the Mexicans did not open the door to us," said Gina Paola Montes, 21, a humanities student from Honduras university. Some, like 22-year-old Alex Benitez, paid locals to take him across the river border by raft. 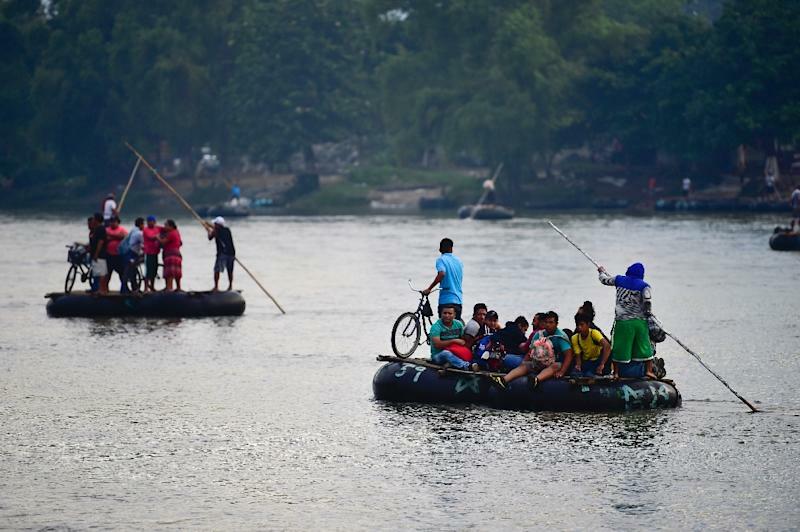 "They promised they will give us a visa but the people are there (on the bridge) since yesterday and they have not given us anything," Benitez said as he waited for friends who were crossing on another raft, made from huge truck tires. Police officers patrolling the area told AFP that for now there are no plans to move against the migrants crossing by river. Some, like 25-year-old Honduran Bryon Rivera, had decided to give up on a long- held dream of a better life in America. "It is better to go back. It is very hard. There is a lot of disorder," said Rivera, who was hoping to get on a bus back to Honduras laid on by the Guatemalan government. The soft-spoken 25-year-old said he was travelling with three friends who decided to remain in the caravan, but that for him, the fear of being deported once he reached Mexico was too much. 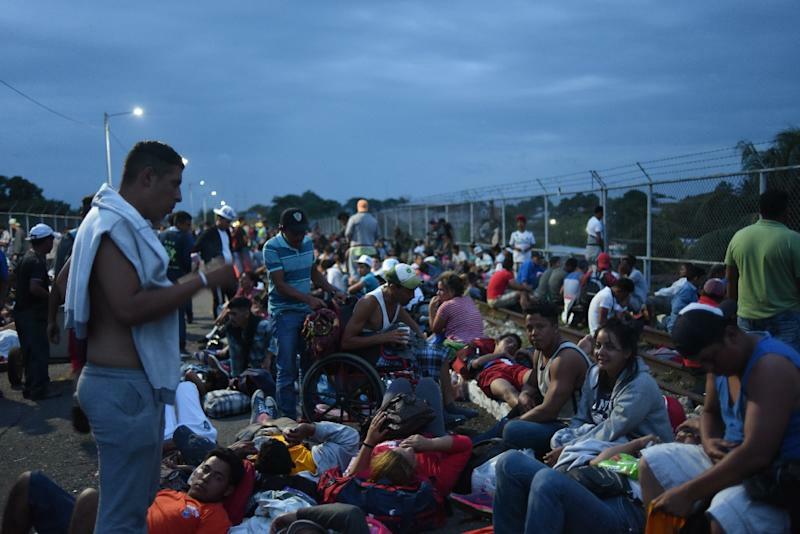 Overnight, a policeman said 220 Hondurans had begun to return to their country and another 130 were awaiting transport in a local migrant shelter. The caravan, in some cases comprising entire families -- many with babies -- has braved intense sun and torrential rains by turn since setting out last Saturday from a Honduran border town. Many have been given food and shelter by Guatemalans along their way. On Thursday, Trump branded the migrant caravan an "onslaught" and an "assault on our country" in a series of typically fiery tweets. He threatened to cut aid to the region, deploy the military and close the US-Mexican border if authorities did not stop them. The migrants are generally fleeing poverty and insecurity in Honduras, where powerful street gangs rule their turf with brutal violence.